I know, . . . It's hard to resist planting lots of those yellow squash(es) and zucchini(es). You think you have everything under control and then, somehow, they get the upper hand and you're inundated with . . . Summer Squash, ahh! All kidding aside, summer squash is one of the easiest veggies to grow. It's very prolific and the most versatile of all veggies! 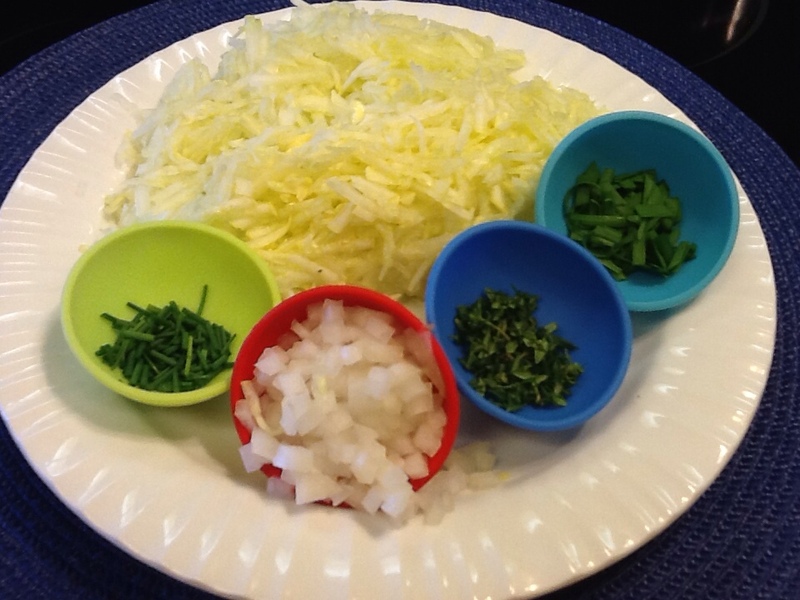 Shredded yellow squash, chives, onions, thyme, garlic chives. 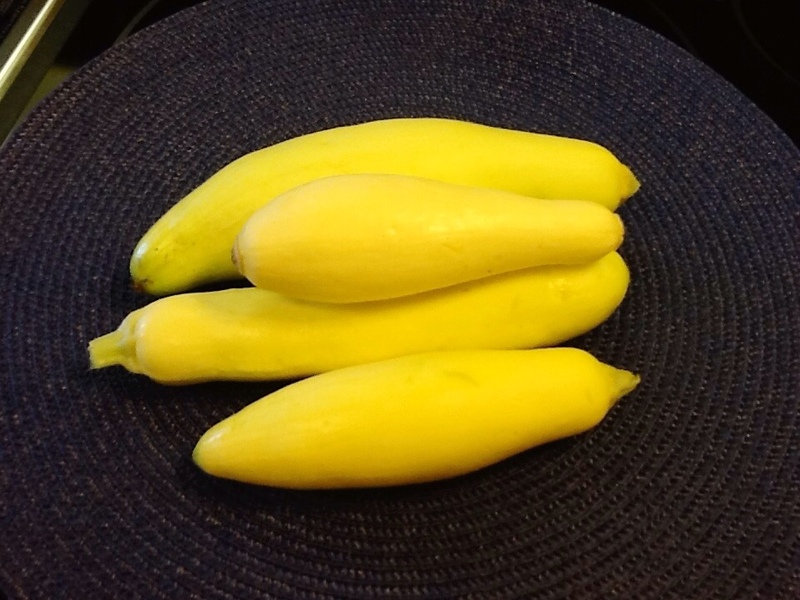 I've chosen to grow more yellow squash than zucchini because they have a little more flavor. You can certainly use zucchini to make my pancakes. Using yellow squash really allows the herbs to show off! This recipe serves 2 or makes 10-12 small pancakes. Feel free to double this recipe for a family of 4. Herbs- thyme, chives, garlic chives, about a teaspoon of each. Shred your summer squash over a dinner plate, using the large grating side of a box grater. Let squash sit for 10 minutes while you prepare the remaining ingredients. Squeeze the squash in your hands, over a colander, to remove excess water, I did this twice. Return summer squash to dinner plate ~ using a tea towel, press it over the squash to again remove excess water. In an 8 cup or medium size bowl, whisk eggs, onions, herbs, and cheese. In a small bowl whisk flour, baking powder, salt and pepper together. 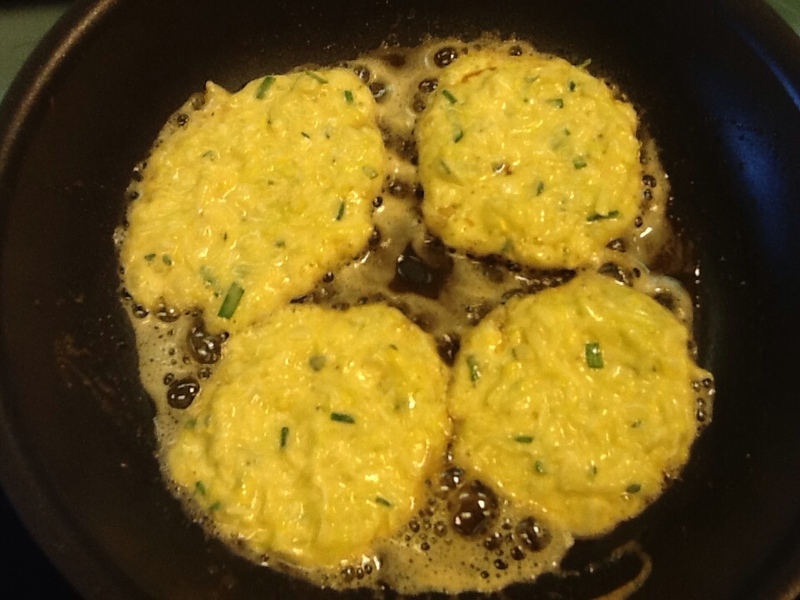 Add flour mixture to egg, herb and cheese mixture and toss with fork to thoroughly incorporate. Heat frying pan on med-high heat, add approximately 1/2 tablespoon butter and 1/2 tablespoon olive oil to pan. Add batter to frying pan in heaping tablespoons, flattening with the back of spoon. Cook first side about 3 minutes, or until nicely browned. Cook remaining side for about 2 minutes. Serve with thick dollop of sour cream, a side of homemade applesauce, melon slice or strawberries and crisp bacon or sausage. 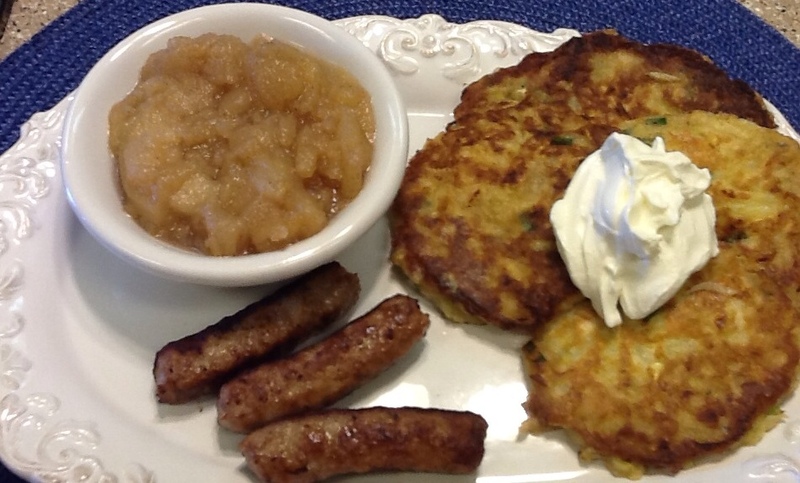 These savory pancakes make a delicious meal ~ breakfast, lunch or supper! Summer Squash can be found in so many delicious forms . . . Here are a few of my favorites . . . Kick~n~It Relish, bread and butter pickles, horsey pickled chips, salsa, pancakes, muffins, cakes, sweet breads, yeast breads, cookies, bar cookies(slices), in salads, fried, grilled, the list could go on and on! I'd love to hear about your favorite summer squash recipe, Please email me (overatjulies@hotmail.com) your best recipe, along with a photo and I'll post it on . . . Over at Julie's so others can enjoy!